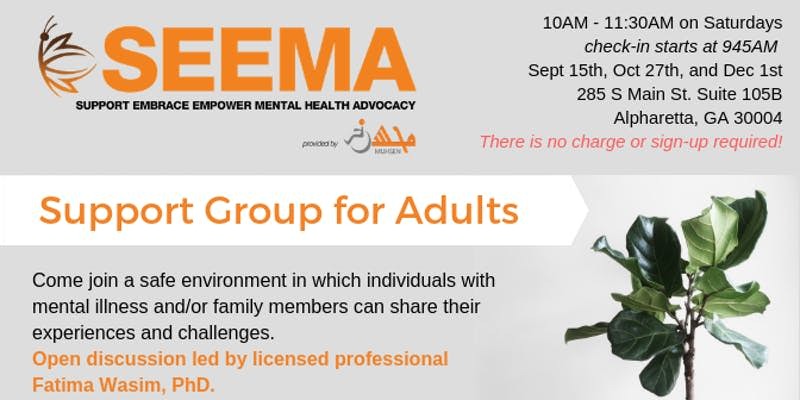 Oct. 27, 2018, 10 a.m.
Come join a support group for adults living with family members struggling with mental health conditions. Open discussion led by licensed professional Fatima Wasim, PhD. There is no charge or sign-up required! Check-in begins at 945AM; Facilitator will start promptly at 10AM. Edit This Event Last Edited By: SEEMA Atlanta on Oct. 15, 2018, 1:10 a.m.